Chelsea is a neighborhood on the West Side of Manhattan in New York City. The district’s boundaries are roughly 14th Street to the south, 30th Street to the north, the western boundary of the Ladies’ Mile Historic District, to the east, and the Hudson River and West Street to the west. To the north of Chelsea is the neighborhood of Hell’s Kitchen, also known as “Clinton,” to the northeast is the Garment District, to the east are NoMad and the Flatiron District, to the southwest is the Meatpacking District and to the southeast is the West Village. People of many different cultures live in Chelsea. Above 23rd Street, by the Hudson River, the neighborhood is post-industrial, featuring the High Line that follows the river all through Chelsea. Eighth Avenue is a center for shopping and dining, and from 16th to 22nd Streets between Ninth and Tenth Avenues, mid-nineteenth-century brick and brownstone townhouses are still occupied, a few even restored to single family use. The conversion of the High Line to an elevated urban park has stimulated much real estate development in West Chelsea, such as these two luxury apartment buildings, “Highline 519” and “HL23” on 23rd Street. 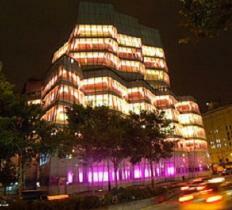 Since the mid-1990s, Chelsea has become a center of the New York art world, as art galleries moved there from SoHo. From 16th Street to 27th Street, between 10th and 11th Avenues, there are more than 350 art galleries that are home to modern art from upcoming artists and respected artists as well. Along with the art galleries, Chelsea is home to the Rubin Museum of Art – with a focus on Himalayan art, the Graffiti Research Lab and New York Live Arts – a producing and presenting organization of dance and other movement-based arts. The community, in fact, is home to many highly regarded performance venues, among them the Joyce Theater – one of the city’s premier modern dance emporiums and The Kitchen – a center for cutting-edge theatrical and visual arts. Historically, the industrialization of western Chelsea brought immigrant populations from many countries to work in the factories, who dominated work on the Hudson River piers that lined the nearby waterfront and the truck terminals integrated with the freight railroad spur. As well as the piers, warehouses and factories, the industrial area west of Tenth Avenue also included lumberyards and breweries, and tenements built to house the workers.